Went for a bob in the sea this morning. Couldn’t really call it ‘swimming’ as it was rather like this. Though I did make it almost as far as the first buoy, apparently about 200 metres out, before I decided that discretion was the better part of valour. I am used to the lake at Clevedon, not this stuff, but it was fun! 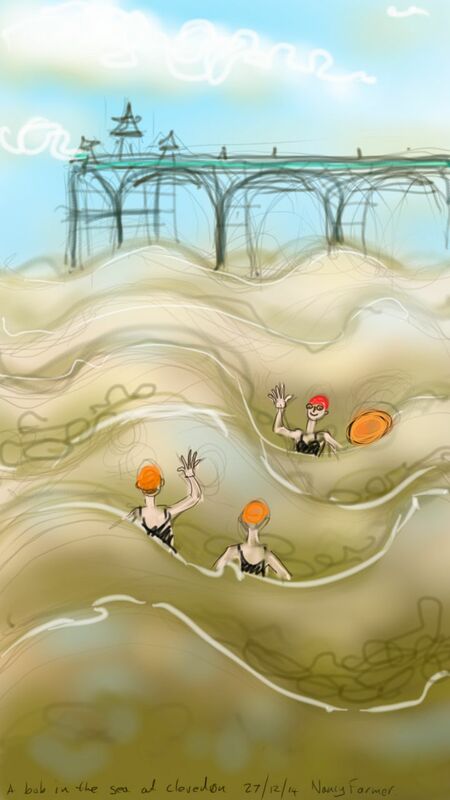 This entry was posted in Places, swimming and tagged art, cat drawing, chillswim tow float, Clevedon, Clevedon Pier, cold water swimming, digital sketch, North Somerset, open water swimming, sea swimming, swimming, tow float on December 27, 2014 by Nancy Farmer. Hope you had fun at Chillswim? I was there, it was a great weekend.